Para Español: Campaña Gatos Adentro! Cats are pets that belong indoors. They are NOT wild animals. They are companion animals, domesticated by humans thousands of years ago. Cats that are allowed outside are more likely to lead shorter lives. Exposure to transmittable and deadly diseases, the constant threat of being hit by a car, and being attacked by a dog or a predator are very real. Cats will kill wildlife no matter how well they are fed. Cats are highly efficient, instinctive predators. Bells are not a deterrent since wildlife does not recognize the sound of bells as dangerous and most cats will learn to hunt silently (even with the bells). 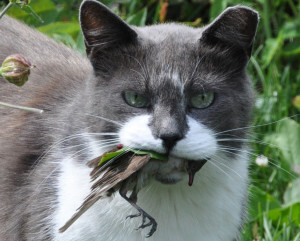 Many bird populations are in a serious and steep decline due to three major causes: habitat destruction, window bird collisions, and cat predation. 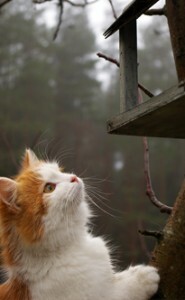 Three to four billion birds are killed by cats each year, and an estimated 100 million from window collisions. Factor in habitat loss and you are now looking at an unsustainable loss of these species. Too often urbanites fall into the trap of believing wildlife is something only to be protected “out there” (beyond our city boundaries). When it comes to migratory birds, we need to be just as concerned about what is happening in our own backyards. Cats also kill prey animals such as mice, chipmunks, squirrels, rabbits, and other small mammals competing with native species (hawks, owls, foxes, and other larger wild predators) that depend on these animals for their survival. Statistics show that the combined numbers of birds and small mammals killed each year by cats is close to 4 billion. Allowing a well fed house cat to compete for wild food sources places native predators at a disadvantage. Bottom line, cats are an invasive and introduced species that does not belong in our ecosystem. The majority of the public is unaware of the danger free roaming cats pose to the natural world. However, this danger to wildlife is an addressable problem that can be immediately managed through community education. Central New Mexico Audubon Society, in partnership with American Bird Conservancy, is committed to providing this public education of responsible cat ownership through our Cats Indoors Campaign. As cat predation continues to increase, this educational outreach has become a vital step for conserving birds. promoting responsible pet ownership focused on keeping cats from roaming. Stronger enforcement of pet abandonment laws. Encourage cat households to house cats indoors. promoting removal of cats from designated natural areas and designated critical habitat areas. Certain locations have been set aside specifically for wildlife and prioritizing those locations for removal of free-roaming, stray, and feral cats. promoting reduction of cat overpopulation through spay and neuter and reducing feral cat populations through Shelter–Based strategies. providing safeguards for property owners who want to protect wildlife on their land (maintaining nuisance laws that provide property owners/managers with effective, legal methods to address cats that come onto their property). You can give birds a safe place to rest, feed, and raise their young by keeping your cat indoors and asking your neighbor to do the same. To give your cat a safe outdoor experience consider leash training your cat or building a cat enclosure and cat fencing. Learn More at These Links!